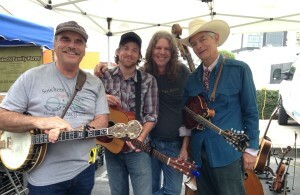 The Fair Market Band plays live music, mostly bluegrass, every Sunday from 8 a.m. to 1 p.m. at the Hollywood Farmers Market. Map. We love the market, the neighborhood, the shoppers, the scene, the community, the children. When the young ones–or anyone, often without realizing it–break into dance steps, we feel we’re doing something right. We’re delighted to play parties, weddings, and gatherings of all kinds. The Hollywood Farmers Market occupies the cross streets Ivar & Selma (90028), between Hollywood Blvd. & Sunset, and between Vine & Cahuenga. Lately we’re near the South end of Ivar, near Sunset, in sight of Amoeba Music. The management booth at the center of the market should know where we are. This is probably the largest farmers market in Southern California, maybe in the whole USA. There is great produce and fruit, also meat, fish, dairy, fungus, coffee, baked goods, juices, an amazing variety of heavenly prepared foods, and fine handcrafts. It’s run by the non-profit Farmer Net that also runs several other markets. Parking is available at several nearby structures for $6. You can park at the Cinerama Dome on Sunset for a few hours and pay a bit less if you get your ticket validated at the management booth.